Practising Christians would know that this day is the 40th day after Christ rose from the dead on Easter Sunday. It normally falls on a Thursday but many countries, including Australia, have moved the day to Sunday, to encourage more people to attend church. The celebration acknowledges Christ’s ascension into heaven surrounded by his 11 disciples (minus Judas), Mary his mother and others. In Germany, it is celebrated on the Thursday, which is a public holiday. It is also called Vaters Tag or Father’s Day and is celebrated by men going walking or drinking in a brotherly way! We celebrated Christi Himmelfahrt at Sankt Petrus Kirke, the oldest church in Munich, established over 1000 years ago. 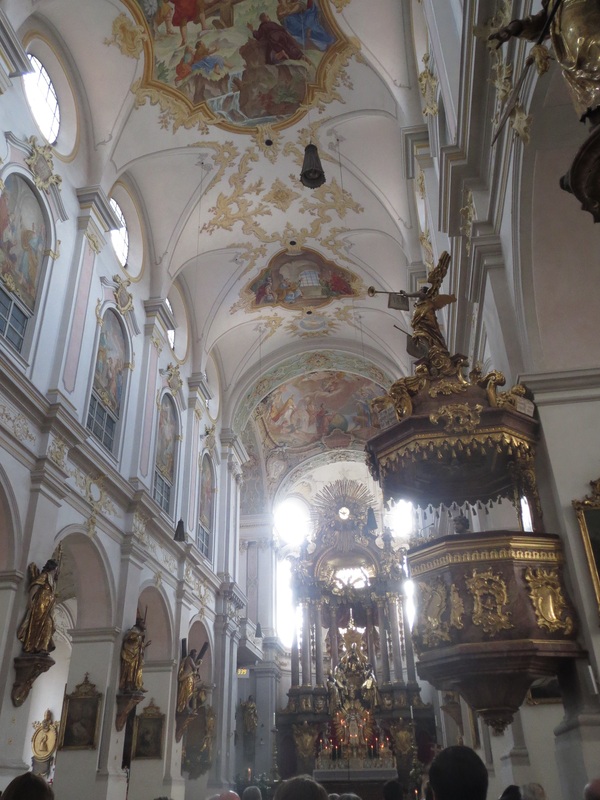 This church was completely destroyed in the Allied bombing of Munich in 1945 and by 1954 had been rebuilt enough to be re-consecrated. Some plaques of the original church remain on the walls outside. 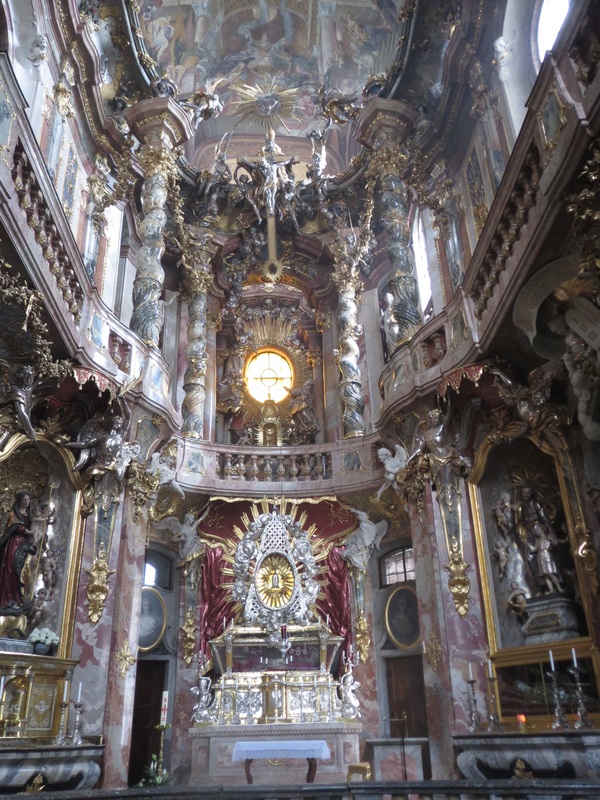 There was a lot of gold – on the altar, around the statues – and the frescoes on the ceiling were beautifully restored. But we were there to hear Dvorak’s Messe in D-Dur, sung by the St Peters Kammerchor and unexpectedly with live orchestra. We could just see the tops of strings section’s bows if we craned back at the organ gallery. The Mass sent shivers down the spine, it was so beautiful but it was strange having the performance behind us out of sight. What was in sight was the full performance of the Catholic Mass, with incense burner being flung around (and occasionally catching fire! ), a lot of bowing and disrobing and robing of the priests, while we struggled to follow whether we should stand, sit or kneel. It was such an occasion that we think we’ll repeat it on Pentecost Sunday (50 days after Easter Sunday), to hear Schubert’s Mass. Asam’s Church in Sendlinger Tor Strasse. Strolling along this pedestrian street, with shops and pubs, lining the street, we really didn’t expect to find a Baroque church wedged into the facade. Asam’s Church was built by two brothers as their private chapel, from 1733. 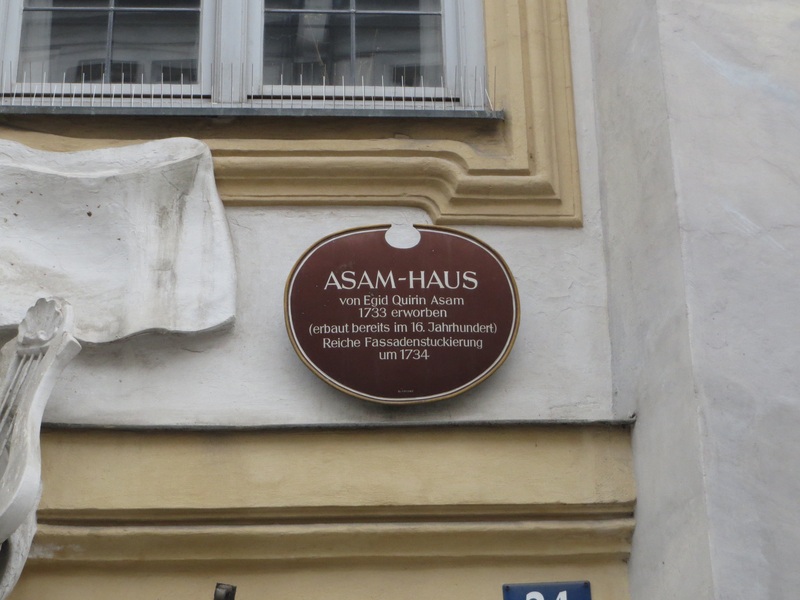 Asam’s house adjoins the church. The style is incredibly ornate for such a tiny building, with all sorts of rearrangements required to make it fit, ie the altar facing the wrong way. This was all possible because it was meant to be private and non denominational. 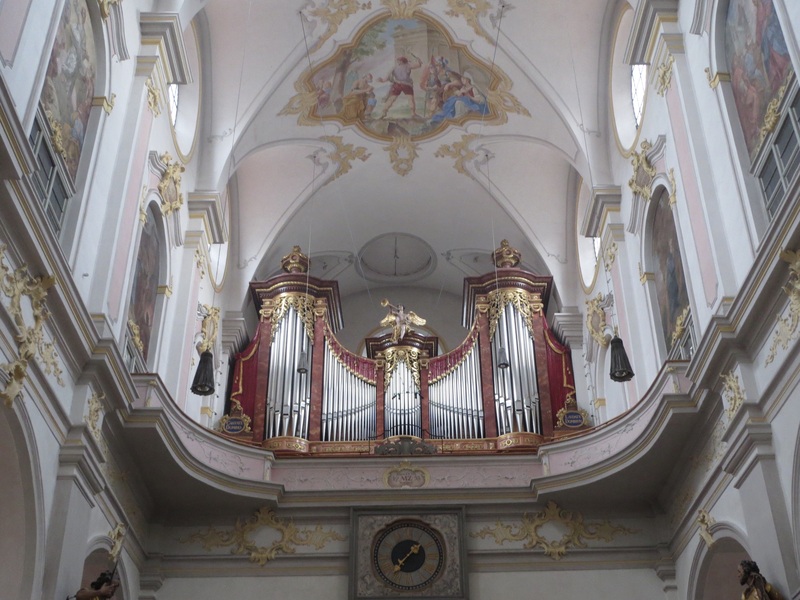 However the Munich authorities in their wisdom insisted that the church be open to the public and it is now known by its Catholic name, St Johann Nepomuk. As is often the case, there will be music played here on the Pentecost weekend, so another concert looms for the price of a church collection. 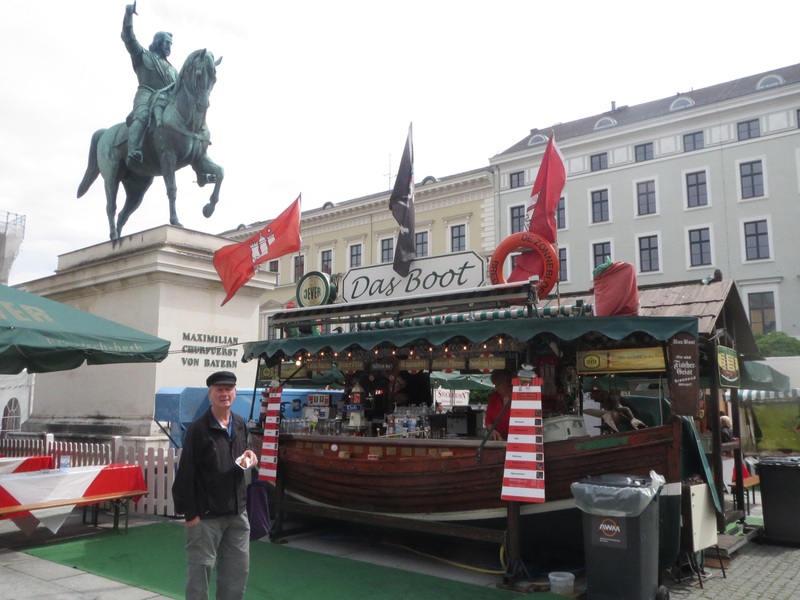 Our journey continued on in the direction of Konigsplatz where we stumbled upon Hamburg’s Fischmarkt, stalls set up under the statute of good old King Max 2, where in good Bavarian fashion a ‘Fest’ day means feast. 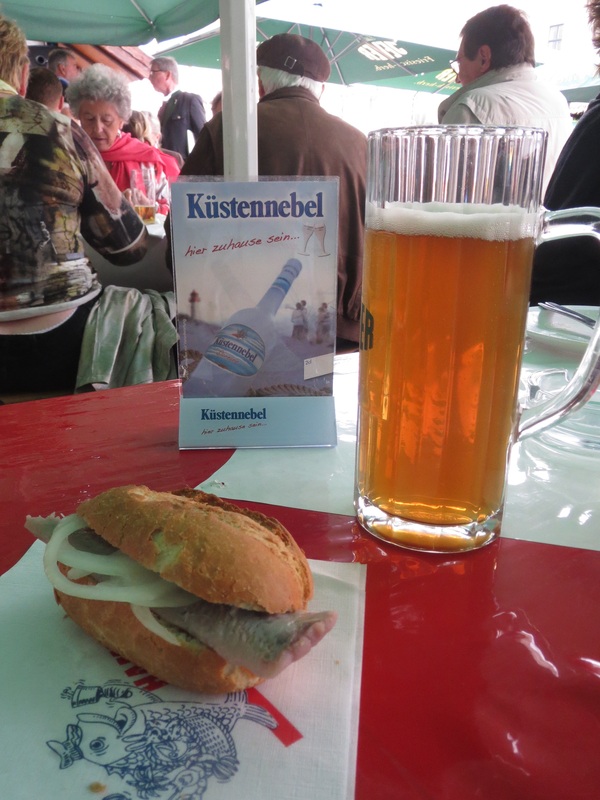 Here you could have a fishy lunch while being serenaded in schmaltzy style by a live singer, complete with her own boom box. 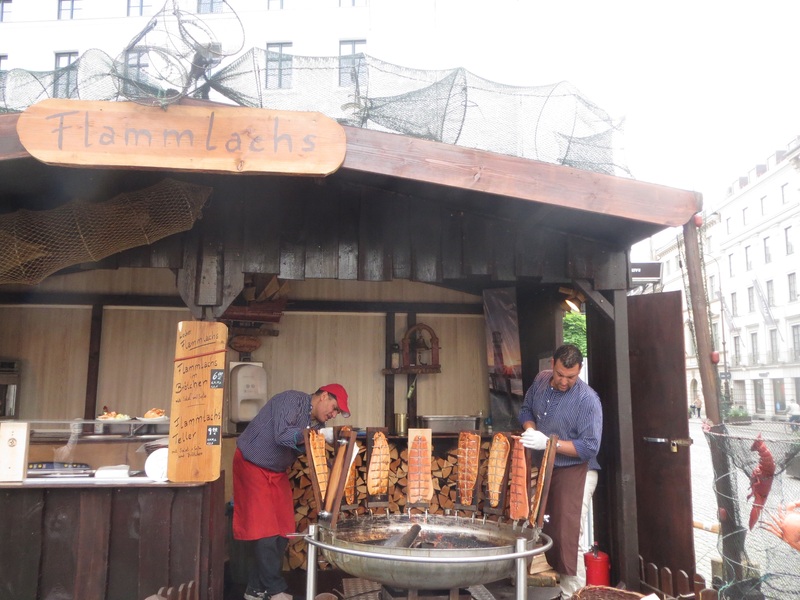 A matjes broetchen went down very nicely on such a chilly day, as we watched huge slabs of salmon being smoked in the open air – rauche lachs. 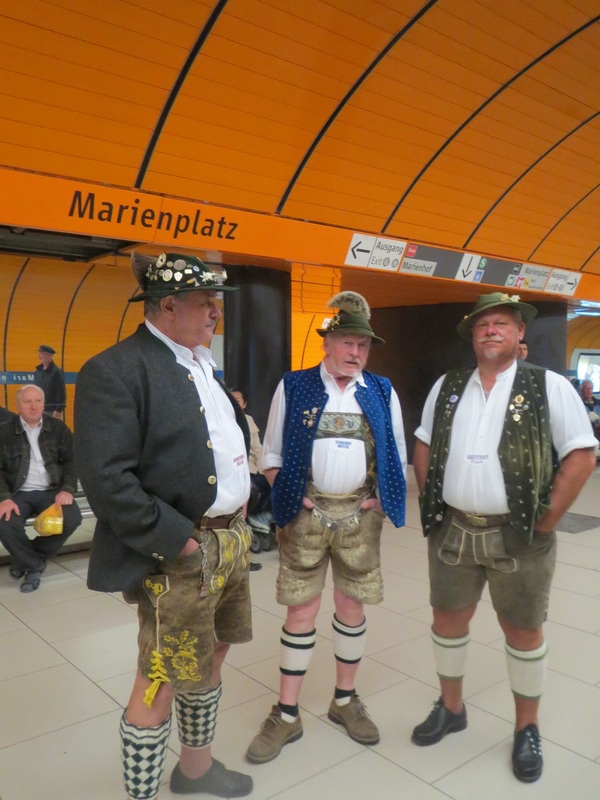 Our excursion ended back at Marienplatz Ubahn station where a trio of happy chaps were obviously celebrating Vaters Tag!